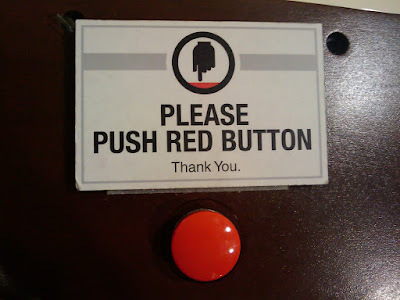 What did the Big Red Button on IBM mainframes do? 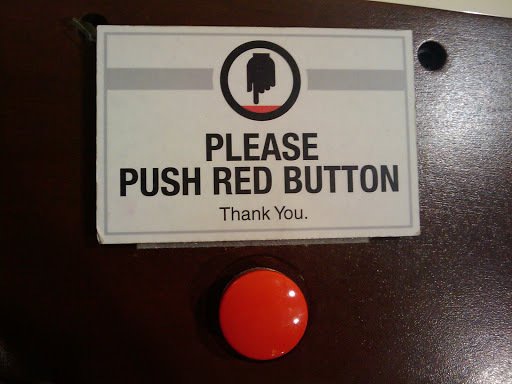 a) Pulling the button would drive a large plastic spike through the mainframe's main power line. b) There was a guillotine over the power cable that chopped the line in two upon someone activating the switch. I know there's a bunch of people around here who worked with IBM mainframes back in the day. Anyone know for definite what it did? Anyone ever have to use it? It must be some cold war era device, If all 20 were hit, a nuke would launch. Anyone know for definite what it did? I'm willing to bet that pushing it out of curiosity got you fired. It was an emergency power off button, I couldn't say what the exact mechanism was but I doubt it was as permanent as physically cutting a line. I once broke one off a Series/1 by bumping into it sideways. Since that's a system 360, that would be the Red Plunger of Death. If it popped out you had to mail the mainframe back to IBM and wait for a refurb to be mailed back to you. "Engineers are really good at labeling and branding things ... If we had named Kentucky Fried Chicken, it would have been Hot Dead Birds." Perhaps real IBMs had the explosive bolts and guillotines, I don't know. Our clone was made by Itel, who sold their mainframe division to National Semiconductor, who eventually sold it to Hitachi. The fun thing about this is that they actually sent someone in to put new name badges on the machine when the division changed hands. Well, when I say plate, I mean really it is half an inch thick. That's right: the big iron had a five-pound chunk of anodized aluminum just for the name badge. I saw a guy once with a whole collection of 360 and 370 badges and nameplates. How I longed for one to hang on my wall. I would like to bolt that front panel to my fridge. DAMN YOU! I was going to post that. I already have a couple of times, though. Ren and Stimpy was my favorite cartoon ever. The IBM's and Honeywells that my dad used to run it was answer A, the BRS was under the tachos that showed the running time, room temp, load ...that sort of thing. It was more like a red handle that killed the main power feed in, there was not just one computer with a switch on it.